We are a community for all levels of experience working with tools and the materials that the tools help us manipulate. Sure we are mainly focused on using Festool products but almost everyone of us used some other tool the first time that wasn’t a Festool. We have newcomers , we have more experienced , but what we have in common is that there was once what I will term “The First Woodworking Experience”. Everybody had to have one. I would love for others to share their stories. There are no rights or wrongs. We have the ability to inspire, comfort, and just share a story or two. Singles, parents, and grand parents all are in encouraged. Please don’t make this another of my well intended threads that die on the vine. Re: What was your first woodworking experience? Ninth grade shop,...shows how old I am, not much mandatory shop anywhere in the US. My first experience was once we moved to Virginia. My parents were from Germany and South Africa and imigrated legally to the US in the middle 1950’s. Dad was intelligentt but mechanically worthless. Mom was Martha Stewart, a painter, and a pretty good carpenter with really crappy tools. We didn’t have excess money with five kids and one income, but once we moved to Virginia (from Arizona) there were TREES. Mom loved to scavenge the woods and she loved finding roots and stumps because the shapes were organic in today’s terms. One day she brought me an Eastern Red Cedar stumplet and a rasp and told me that she wanted me to make something. That rasp and I spent tim together and the result was probably the worst rendition of a shark or a dolphin, but it wasn’t,t a root anymore. Twelve years later I lost a bet and got into construction and I have made much of my living doing that. I bet that others will have better stories to tell! High school circa 1968 or 1969. A local pastor taught shop class. I remember him saying the radial arm saw was dangerous for ripping. Luckily never had any issues with it. We had the RAS and a lathe. Don’t remember any other power tools. My first project was a small bat (more like a club) for my older brother who was a cab driver in Portland. There had been some instances of cabbies being robbed, so I thought the club might be useful. Happy to report he never had to try it out. I think I turned it out of a block of mahogany. Haven’t turned since, but hope someday to try more of it. 1969, 7th grade shop class. I have been woodworking ever since. For our first project, we were given a hand plane & a 1 x 12 x 4ft piece of white pine. We had to plane the end of the board square in both directions. After the teacher verified that the end was square, you could make a project out of what was left of the board. I don’t recall what my first project was. My maternal grandfather was a renaissance man of sorts he was a vocational school shop teacher in the 40’s, car salesman in the 60’s, builder/developer in the 60’s and 70’s, and a real estate agent in the 80’s. He was adept at many things and seemed to be able to build anything and everything. My father is the same way as far as being able to seemingly build anything. I have seen pictures of myself holding a hammer while in a diaper with either or both of them working on one house or another. The earliest projects I do remember are my grandfather setting me loose with an old keyhole saw and a yankee drill on a scrap he clamped in a vice. I also remember a simple toolbox my grandfather helped me build (simple box with a dowel handle that I still have). I remember several Pinewood Derby cars and a large trunk style chest that my dad helped me with when I was in Cub Scouts/Boy Scouts. 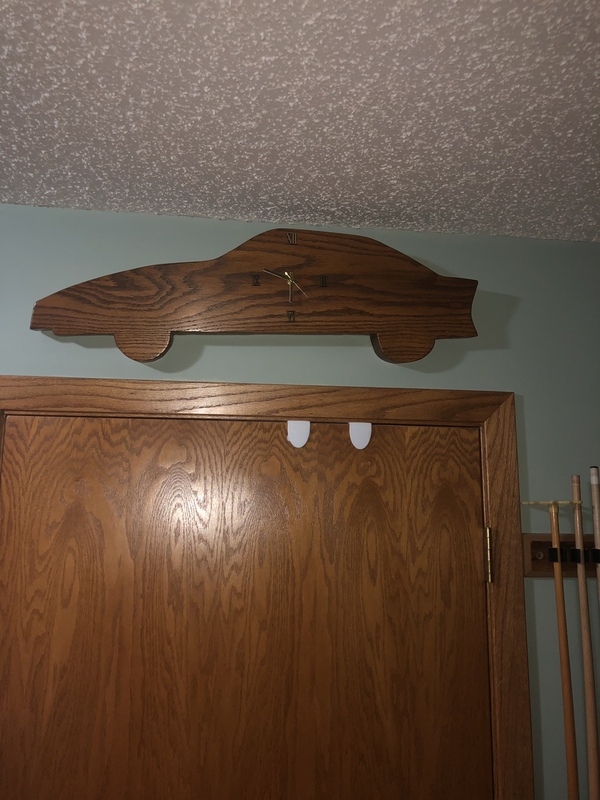 My dad still has the cars on a bookcase. The first project I completed start to finish by myself was a clock in 7th grade Industrial Arts. Would’ve been about 1988. I remember going through all of the stages: concept drawing, full size drawing, choosing the board, transferring the pattern to the piece, rough dimensioning on the bandsaw and sanding to the lines with a spindle sander and hand sanding. It was supposed to be a Corvette. My dad hung it in their rec room. It’s been over the door for the past 30 years. That house is now mine. Twelve year old me was proud of that piece. 42 year old me is still proud. It’s not perfect, but in my biased opinion it’s pretty darn good for a first piece. I look at that clock every day. And everyday I think I should probably put a battery in it. Maybe someday. My parents had no mechanical aptitudes whatsoever and no desire to acquire any. To them tools were only for professionals. I watched them be so dependent on tradespeople for everything and as a little boy I watched those tradespeople like a hawk and I discovered a love for understanding how things worked and how to fix things and ultimately how to make things. Ironically I was not allowed (by my parents) to take shop classes but they did buy me woodworking books (I still have them all)! Ok, then later I turn 25, get married and we buy our first house. My wife wasn’t entirely convinced that this was the right house but she was seven months pregnant with our first child and so she said as long as I made sure that she got new countertops and backsplash in the kitchen right away that it would be fine. We bought the house and I immediately got a quote for the countertops. I’ll never forget that quote was $2,200 which was about $2,000 more than we had. I took out one of my TIME life how to books and convinced her that I could do it but I needed to buy a router, a circular saw, some plywood, Plastic laminate, contact cement, etc. Well that was about 35 years ago and we are still buying tools and doing projects together! At 7-8 years old my grandmother gave me a tool kit. With some plywood, other wood scraps, and some nails I set about work in her basement, where I managed to make myself a table and seat. For the next few years I proudly brought them out every Christmas and used them. Thankfully they are long gone...as they looked like a child made them. Later on she proudly displayed a few painted wood carvings of mine, with the prized one being a penguin. By the age of 13 I was a wood butcher. I mean that literally, as we used a chainsaw often in building miles of fences, by skimming the bark off the side of a tree to nail a board to it. Fortunately I have had some excellent mentors to help me along. My father passed away when i was two years old, he was a highly competent hobbiest woodworker, and at 5-6 years old i discovered his small work bench and rusting hand tools in the cellar of our house. Im not exactly sure if i was making anything back then, but i would spend a lot of time down there clamping wood in the vice, sawing it and then nailing it to other bits of wood. 3-4 years later i was lucky enough to be in a school where art lessons included drawing, painting, ceramics and woodworking. I was introduced to acurate hand sawing, chiseling/drilling mortise and tennons, predrilling and planing, sanding, finishing.... Very lucky indeed. I can still hear my teacher telling me that the fastest way to remove material is drilling..
Of all the trades, i consistently find that those who identify as carpenters seem to have the most wide-ranging skill sets. I would much rather have a carpenter fix my tiled roof, sort my leaky plumbing, or re-lay my drive than i would a metal worker or a... (Insert trade not directly related to task).. I have re-wired my own flat, after an hour or two of research but met many electricians who can't even use wall plugs properly.. There seems to be something about the minds of the people who gravitate to carpentry that just enjoy making, fixing and solving all sorts of practical problems. I'm not suggesting this is a hard rule obviously, just my observations.. I grew up watching TOH with Tommy and Norm, playing with legos (still do - what can I say). I always liked to put things together. The first experience I remember 'building' something was a lamp I built sometime around 6th or 7th grade. The bug didn't bite then because I had no confidence. I went to a catholic school so we had no shop class where kids could learn. I then remember building a desk when I was in college - epic fail. But I didn't let that deter me. Fast forward to today where i've built two sheds, a desk and bookcase for my son, two bathroom vanities, cutting boards for gifts and i'm working on a rustic console table for the wife. I have enough work, all self induced, to last me the next 12 months. I want my kids to remember me as a dad who could build or fix anything (I don't touch electric or plumbing). Mine was somewhere around the 6th grade. After having spent years being dad's apprentice around the house doing DIY fixits, they had a rotation in industrial arts for one period. I got to trace out a shape onto a 3/4" piece of pine, carve it up on a bandsaw, sand it out on a disc sander and viola, my first "project" was born and I was hooked! It was a 12" tall pear. That one has survived the years and lives on the wall in my parent's breakfast area. I suspect not because they love it so much, but that it would create a void that would have to be filled with something else if it were removed, so it remains. Fast forward a few years to high school and I had a chance to squeeze a wood shop class into my schedule. I wasn't allowed to drop my other classes to take it so I had to meet with the counselor an my parents and come to an arrangement to replace my lunch period with shop time (can't imagine any school agreeing to this these days). My project for the year was a coffee table made of white ash with 4 small 12"x12" raised panel doors. My shop teacher had a template for larger raised panel doors which didn't fit the proportions of smaller raised panels. We cut them on a table saw, so he told me to practice on scrap until I got the cuts right. I thought that would take the better part of a few classes to get it right, so I went home and used trigonometry to figure out my angles and depths. I came back to class and showed him my calculations, he agreed it was a good starting point to make test cuts. Off to the table saw where he showed me how to make the cuts safely. As we made the last cut and the waste fell away we had a perfect raised panel door. He in disbelief and asked "How did you do that again??". I started to explain the math, he lost interest before I got 10 seconds into the explanation and grabbed my test piece. He now had TWO templates for raised panels doors to offer his students! That coffee table still lives in my parent's family room. It's not a work of art, but at the time I was so proud of it as it was the largest piece of work I had ever tackled. That love of working with wood never left me. It remained dormant for many years until space and budget allowed me to consider making it a hobby again. I am around 10 or 11 and in my father's workshed with my father and his father in law - my grandfather. My father is a carpenter, my grandfather a retired wooden boat builder. He had retired long ago following injuries suffered on the Soome, WW1. Together, the three of us are each hand sanding three kitchen tables. After 3 or so hours I look to my grandfather hoping I am finished. He eyes it and then rubs his long weathered fingers across my table top. "Keep Going Laddy". At eighteen I follow my mothers profession and enter teacher training. With the purchase of successive homes, my skill base increases. Upon retiring from teaching, I embark on building a whole house and then restore another for sale. Every time I pick up a Festool Sander, particularly my ETS150, I remember that tabletop. These are GREAT! Keep them coming. My dad was a Master Craftsman, who was employed as a Millwork Supervisor and Project Manager for a Commercial Construction Company in the Napa Valley. Although I use to watch and help him with woodworking projects since I was a very young boy, the first experience I remember was in the late 60"s, helping my Dad build a Pinewood Derby Track for our Cub Scout Pack. As a teenager, in the early 70's, I worked a few summers in my Dad's shop, primarily sanding and assembling wine racks and other items for many of the Wineries in the Napa Valley. I never went into the trades, but have been an avid hobbyist woodworker ever since. I'm sure I hammered or sawed some crap project when I was a kid, but woodworking came for me when we bought our first house. The closet where the furnace had been still had a louvered door, and I bought a six panel slab and had to install it. Got a starter 18v kit for Christmas, but realized I needed a router to do the hinge mortises. That was nine(?) years ago. I since have built my own shop from scratch, spent thousands on tools, and am now basically in charge of set design and construction for a local theatre troupe. Using my father's borrowed pocket knife to try to make a pinewood derby car --- razor sharp of course, so each time I cut myself, I went to the bathroom, washed it off, and put on another Band-Aid. Finally my mother discovered me in there when I was washing off the latest cut, and trying to figure out what to do now that the box was empty. I then passed out, and got my first trip to the emergency room. Placed third. The Denmaster said that I did a really good job competing against everyone else's dad. - a handle nailed to the one end of the front bar. The only tools used were a handsaw and a hammer. I sat on the base and steered the car as one of my brothers pushed me on the back...we took turns for the fun, of course. No electronic games (not invented) or even B&W TV (too poor) to distract us in those days. No other woodworking projects were undertaken between that car-making experience and my taking up hobby woodworking almost 30 years later. Worked on a number of small projects with my Dad growing up. But I recall buying our first home and shopping for kitchen cabinets. We could not afford what we liked. I went to a lumber yard and met a retired cabinet maker. He drew the basics of cabinet construction on a piece of scrap cardboard, loaded my car with lumber and I went home. Found a used Sears tablesaw in the classified ads and called my Dad to mail me his router. My wife and I built the cabinets (oak veneer ply with a sprayed lacquer finish), installed them, painted and wallpapered the kitchen in 9 weeks. We still laugh about the long days of working and then coming home and building cabinets in our basement till after midnight. But that project got me hooked! My dad was a big do it yourself guy. We lived in a 200+ year old house and he was always remodeling something. I started making wooden plaques for decoupage when I 11 or 12. I would go to the lumber yard and dig scraps out of the cutoff bin. Then cut those scraps in different shapes and route the edge then sold them to the neighbor who took them to her class and sold them. I’ve been a hobby woodworker ever since. My dad had a disc sander we used to sharpen survey stakes into dangerously pointed swords. Later I sculpted a tougher Conan sword on that disc from a length of hardwood and carved a recess for a decorative inlay using some carving tools I'd received as a gift. I remember expressing an interest in carving and maybe carving some soap, but aside from slicing the artery in my thumb open and carving that hole on different occasions I don't remember using them until adulthood. The inlay was a metal skull with jeweled eyes I had bought at Disneyland as a keychain - the loop had broken off and I repurposed it by pressing it into the hole with modeling clay for a thoroughly awesome effect. Other than that, I sucked at woodworking for a long time thereafter. Was given a set of small Japanese carving chisels for a 6th-8th birthday gift together with a few blocks of Huon & King Billy to use 'em on. Started carving a variety of boats & ships: a galleon, MTB, Royal Marines landing craft etc. I can also remember about that time unsuccessfully (it never flew) attempting to assemble a box kite from Balsa too. Great idea for a thread, Peter! I think my first woodworking project was to build a clubhouse (shed) behind our home. My dad had made a few hundred kneelers for the church, so I got some really good lessons in what NOT to do, like try to cut off the end of his finger with a radial arm saw. He eventually did a great job with the kneelers, even upholstering them himself. In any case, the shed didn't last long, mostly because it detracted from the house, so it went. Then I got into bicycles. My dad couldn't fix them, so I taught myself to do what was needed. I marveled at his ability to fix lights and things, well, until I went to electrician's school. When I got home on leave and re-examined his electrical work, I was horrified and set about fixing everything right, and according to code. Eventually I got into building small projects for friends. I took the opportunity to attend a Shelter Institute class for owner-builders and got hooked. It just evolved from there. I'm sure I made a pig shaped napkin holder or something similar in a 7th grade shop class but it's my Brother's first woodworking project that I remember best. Growing up in Southern California in the early 70's we had a pool. My Brother who was probably about 13 or 14 at the time convinced my Father that he should be allowed to build a boat. Being an engineer my Father likely had grandiose ideas of what his oldest son was about to create so they went to the local lumber yard and bought 5 or 6 sheets of (yes, that's right) particle board. As if that was not already cause for alarm, my Brother proceeded to spend the next day and a half to build a four sided ships cabin with a door, window cut-outs, and a flat roof on top. Once my he was content he had a good place from which to sail his ship, and nearly being out of sheet goods, he nailed the cabin to a flat sheet of particle board likely thinking it was the equivalent of a raft. He manned the cabin and my Father "launched" the craft into the pool which sank in less time than it took to say . I clearly remember it listing to one side and violently going down in one quick movement. My Brother had second thoughts on the way into the water and he dove out of one of the cut out cabin windows on the way in adding even more comedy to the event. I don't remember how the craft was removed from the bottom of the pool as I was ordered into the house for laughing too hard but I remember that afternoon as if it was yesterday. Just wondering if your father ordered “abandon ship”? Ninth grade HS was my first introduction to woodworking. It was in my 10th grade that I had my most memorable experience. As you can see, I had learned a whole lot in a short time. I knew it all. My mom had just bought the old house at 348 Belden Hill with no heat, electricity or running water. There were dozens of projects that needed doing and I was in my glory. For the first year in the house, the only heat was the kitchen (kerosene) stove with its many idiosyncrasies, too numerous to go into here. I am sure there are a few of you out there who are my age (39 for nearly 50 years) who have had their own experiences with those cantankerous and smelly monstrosities. Anyhow, for our second winter, Mom bought a large kerosene space heater from Sears (maybe that heater was the beginnings of my admiration for much of what Sears has had to offer thru the years). We decided the best place to put the stove would be in the cellar directly under the living room floor. Once the hole was completed, my buddy, who had mainly been an observer to that point, offered to give me a hand setting that monstrous floor register in place. He took one side, and I the other. As our fingers neared the edges of the floor opening, we simultaneously let go so the iron could settle into place and my job would be done so we could get back outside to play ball. CRASHHH!!! The hole was exactly 1/4" larger than the total register dimension, NOT 1/4" larger than the vertical flange. Oh well, we had been quite accurate in our aim. That register never touched a bit of the wood floor as it descended directly and flatly onto the space heater waiting below. It was great my Mom had a sense of humor. She laughed (I think) and went to Sears and, luckily, found a new register to fit my opening with only minor adjustments to one side of the flooring. EPILOGUE: My mom was taking a metal working class in Westport. Her instructor was my shop teacher, Mr. T----. Of course, Mom just had to tell Mr. T all about my big operation, for which I took a lot of ribbing from my favorite teacher. His favorite advice thru the years was always, “There is no such a thing as gud’n’nuff, it’s gotta be perfik.” Well, my mistake was the perfect set up for him for any mistook I might make from then on. My first experience was building a fort with my friends in his backyard when we where 12. We where off for summer vacation and after a day of biking around, going to the corner store and playing in the quarry, we decided to build a fort in the backyard with his dad's tools from the shop. This was in a time when we where allowed to stay at home by ourselves at that age. We used scrap wood and good would and a circular saw without any guard and what seemed like 200' of extension cords. I remember the first time the saw kicked back on my friend cutting unsupported 3/4" ply. We didn't think anything of it when the saw went astray and almost nailed him. If anything we laughed and kept going as pre-teens do. I wish I had a picture of what we built, it was horrible but to us it was a master piece. Looking back what was even more amazing was we used whatever was in the garage, hardwoods, softwoods, plywoods, osb and all the screws and nails we could find, when his dad came home who was a hobbyist wood worker was not impressed as we showed off are masterpiece. Apparently your not supposed to use oak, cherry maple as roof sheathing and siding on a fort. we where at least smart enough to use a brand new waxed canvas tarp that we cut up for the roof to protect it from the rain. I still remember the look on his face and the immediate urge for all of us to get on our bikes and go home before we got in more trouble. Once his dad cooled down the next day we all ended up being employees for the next weekend to load square bails in the loft. If you've even done that on a farm you'll know exactly what I mean. Bail after bail coming in through that opening and running around stacking them as the space got smaller and smaller. I think the old man was teaching us a lesson because there where more bails coming into that mowe than two people could handle. He even rotated all the boys through a shift up there and made his son stay up there the whole time. So do I remember my first time, yes! A year later it was the place where we all shared a borrowed bottle of sherry from his dad's liquor cabinet, we got into trouble for that too. Truly, youth is wasted on the young! To keep me busy while he was doing one home project or another, my father would hand me a scrap of whatever was around and encourage me to do something with it. The one I remember best was a piece of maple that I was trying to hammer nails into at about age 8. I didn't get very far! When I first got married (25 years ago) and had a son, we bought a condo. It was a fixer upper. I was a Marine Machinery Mech by trade but knew nothing about home repair especially wood working. A friend of mine came to visit and we were talking. I told him that we needed a new kitchen plus a lot of other repairs. I couldnt afford to pay someone so it will wait until I got the money. He suggested that I take some construction courses as the college near by had a great trade school with classes instructing all sorts of trades. to almost quote him " Why pay someone, go to the colelge learn how to to do it and build them yourself". So I signed up for woodworking as my first class. I met a guy who became a good friend that I still see. Well we made a book case in the class. It was a disaster trust me. At the end of the semester the instructor was giving the projects back to the students to take home. He had mine and was asking who it belonged to. I did not raise me hand embarassed I turned away not making eye contact. Probably when I was about 8 or 9 back in the mid 60s. I belonged to our local 4H club and also Scouts but in 4H we learned basic woodworking and electrical stuff. Our WWing classes were at the boat shop down at the docks. This was an old place where they used to build boats but in the 60s that was gone and the shops sat empty most of the time. Mr. Knight owned the place and taught us how to use and care for hand tools, basic layout, and guided us on some simple projects. The one project I remember making was a door stop. Real simple T-shaped style which we shellacked. I gave it to my Mom as a Mother's Day gift. Last Christmas I was at my sister's house and noticed a wooden door stop holding a door open. I asked where did you get that and she said "Mom gave it to me". I told her I had made that 50+ years ago and she said she knew because Mom had told her. It had been about 40 years since I last saw it in my Mother's house. Next time I am there I will have to take a picture of it. I also remember making a milk carton holder from wood and sheet metal, a small table top book rack from pine, and a electrical test light using a 230V lamp in a pigtail socket which we folded the pigtail leads back up on the bulb and secured them with friction tape with the leads spaced about 3/4 of an inch apart so they could be inserted in a receptacle. The light glowed dimly at 120v. Don't what happened to that. Last I saw it was the last time I moved and that was 21 years ago. No idea where it is now. Mine was apparently as a toddler, picking up a hammer and nearly hitting my dad with it, whilst he was fixing the fence. Not a lot of money at home when I was a kid, so I always had to get a summer job. When I was 16 I got a summer job with the school district as a carpenter's helper with the maintenance department. Kept coming back up through first two years of college. First year was pretty much just labor - hauling bags of cement, simple demo and disposal, cleaning up after the carpenter. Over the years he taught me basics of tuning up doors, repairing windows, drywall, etc and sent me out on my own for simple jobs. Toward the end I was doing some simple cabinet making. Didn't do any furniture making until decades later, but at least that gave me the self confidence to try and learn new stuff. Probably my father teaching my brother and I how to use his lathe is the first woodworking experience I can remember. Just making sawdust and a round piece of wood was fun, regardless of whatever we were turning. On a side note, it was a Sears Craftsman lathe made in ~1940 that my grandfather gave to my father as a high school graduation present (my grandfather was a machinist). My father, who is now an active 94 year old, gave me the lathe and all the accessories a few years ago. When I get my retirement home and workshop built this year the lathe will be a featured tool. I'm also looking forward to restoring it to a like new condition. In all these years it's only had the motor replaced. Nothing like solid cast iron and machined steel. My father gave me a life long appreciation for good tools, guess that's why I appreciate Festools. I was just a kid - maybe 4-5 years old building toys out of wood with my grandfather. We built swords, bows and arrows, toy rifles, pistols, roman catapults, gocarts and tree houses. Eventually by the age of 10 or 11 I built with him my very own playing house with a proper concrete foundation, glass windows, tar paper roofing, electricity, lights and doors with proper locks. I think the absolute first thing was a simple sword or it might have been a whistle - can't remember for sure. I remember that I got to use a handsaw and a sloyd knife to do it for the first time. I took all possible shop class, computer science and electronics in school from 3rd grade until 9th grade I could which translates to about 4h / week for those years graduating from hand tools to power tools on wood to metal work and welding in middle school. Subsequently I did help my uncle build his house from the ground up so did everything from building the foundations, building the concrete molds, rebarring the plates, concrete pouring, wall assembly, inside trim installation, electric wiring, fuse box connections, roof tile installation, insulation, etc. All manners of things except not much plumbing. Now trying to teach my own son to do things - started at the age of 5 with him and made a wooden Katana with him. Then came Thor's hammer, British Longsword, Viking Axe and now we're tipping our toes into electronics at the age of 11.